Through my extensive network in Las Vegas and San Diego, I am pleased to offer clients and investors direct access to the best of these two exciting cities. 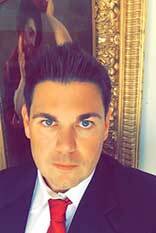 If you need entrance to the hottest nightclub in town, tickets to the best shows or sporting events, a contact at a top private school, or just a referral to a great attorney or doctor, I am pleased to refer my clients to the best of the best and give them white glove service from start to finish. The Fantastik brand originated with our first furniture store on East Charleston near Downtown Las Vegas in the early 1970s. Harry Brown opened Fantastik Furniture Warehouse in 1979 at 1717 South Decatur Blvd. in the former Vegas Village location he bought from the Elardi family. The Fantastik name has a history of success and signifies value in Las Vegas. 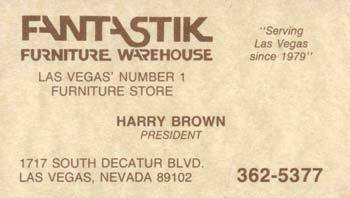 Harry Brown opened Fantastik Furniture Warehouse in 1979 at 1717 South Decatur Blvd. in former Vegas Village location he bought from the Elardi family. The Brown family sold the old building in Las Vegas to the Fantastik Indoor Swap Meet who leased it for many years after Harry Brown retired. Over thirty years later, his son Robert Brown carries on the tradition of value and customer service at Fantastik Realty. Fantastik Realty offers incredible value, superior customer service, and a name with a long history of success and brand recognition after over thirty million dollars of TV, print, and radio advertising. View Original Fantastik Furniture TV Commercials ! Barbara Brown was born in Southern California in 1947, and moved to Las Vegas in 1965 to pursue a career in show business. Upon marrying Harry Brown in 1978, she came to help manage the family's real estate holdings and Fantastik Furniture on Decatur and Oakey. In 1992 she began a career in Real Estate sales. Barbara has sold over one hundred million dollars in residential and commercial property, and has been involved in every aspect of brokerage including: high end residential, high rise condos, residential rental, industrial, office buildings, apartment complexes, gas stations, land, and casinos. Her 40+ years in Las Vegas have given her an extensive network of contacts, and she is known for her utmost honesty and ethics.